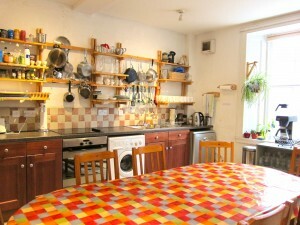 Friendly, large, open kitchen available to hire for self-catering in conjunction with other rooms. Fully equipped, providing sink, electric cooker, dishwasher, large fridge-freezer, microwave and washer-dryer. Large wooden table and chairs for 10 people approx.